"The sea trade around Llyn"
The Llyn Peninsula was the last part of mainland Britain to use the sea as it’s main source of trading, indeed not until the early 1900’s did the roads improve enough for transportation by land to gradually take over, and it was the mid 1930’s before the last of the little sloops, ketches and schooners finally left our coves and beaches. And some of the quarries much later, for example Nant Gwrtheyrn stone jetties didn’t close till the early 1960’s, and up until then little steamers would call there almost daily. In the year between August 1811 and August 1812, 29 loads were exported from the following villages of Llyn, mainly butter, cheese, eggs, and chickens. 8 from Rhiw, 5 from Aberdaron, 5 from Porthor (Whistling Sands) 8 from Porthcolmon, and 3 from Porthsgaden. And even more was imported, 35 loads in total, mostly Lime and shop goods, 11 to Rhiw, 6 to Aberdaron, 5 to Porthor, 7 to Porthcolmon, and 6 to Porthsgaden. But by 1831, Porthsgaden alone imported 43 loads of coal, lime and shop goods, and 19 loads of farm produce were exported mostly wheat, pork, eggs, chickens and butter. 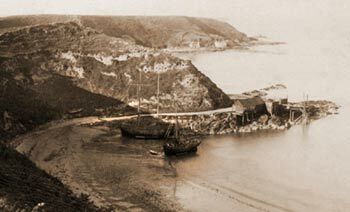 So quite clearly by the mid nineteenth century, trading around the coast of Llyn had grown considerably in only twenty years, and was vital to the local economy. And when you consider that most of this trading was done in the fair weather of late spring and the summer months, these little “ports” would have been bustling with activity. There is one account from the mid nineteen hundreds, of a young girl from Uwchmynydd, every month she would collect eggs from the farms and crofts of the area and take them on the sloop “Catrin” from Aberdaron to Liverpool, there she would sell them at market, but not only that, to save money she would walk all the way back to Llyn. (over one hundred miles) And the day after arriving home, she would go around all her customers with the profit she had made. 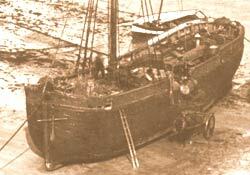 "Unloading a barrel from a sloop at Porthdinllaen in 1893"
The list of goods that these little ships carried is endless. In August 1759 the sloop “Lively” owned by Evan Mark, the father of the poet Ieuan Llyn, brought five dozen felt hats to Porthsgaden from Caernarfon. And five hundred Lemons were landed at Pwllheli as early as 1730. "Porth y Sgaden in 1886"
Lime was a very important cargo, as it had many uses, and a lot of the beaches had kilns built on them so that the lime could be fired on the beach before delivery, Aberdaron beach for example had two of them. The main uses for lime were, mortar for building, but the bulk of it was spread on the land to lower the acidity of the soil. The import of iron is very interesting, farmers would go down to the "Porth" with their horse and carts, and then they would pick up the iron that they had ordered and take it to the Blacksmith, he would have boxes for each of his customers with the farm name branded on the side, so whenever implements, gates, horseshoes, nails or any tools had to be fabricated, he would use the iron from the appropriate box.